Fultape Electronics Co., Limited is specialized in development and production of LED display, LED screen, indoor led display, LED curtains, advertising led display and LED digital billboard. We have been executing rigorous quality control and keeping our out of control rate less than 0.0001.
features of Fultape indoor full color LED display are as follow. Up to 1200, 1500 and 2000nits ultra-High brightness makes the LED display feature anti-sunlight (anti-strong-light) or anti-glare and capable of display the picture and text even under strong sunlight condition and/or strong ambient light environment. Constant current driving LED module (IC) and specially designed controller make LED display feature high refresh rate and high color uniformity. Constant current driving does reduce power consumption of LED display. And low power consumption helps users save energy significantly. Aluminum material of cabinet makes LED display easy to carry, install and service or maintain. It is able to work under super low temperature, as low as minus 20℃. Customized design can even let it work under temperature lower than minus 20℃ like in North Russia. We provide you a wide range of pixel pitch of outdoor LED display models to meet your various kinds of installation and application needs, including 3mm, 4mm, 5mm, 6mm, 7.62mm, 8mm and 10mm. 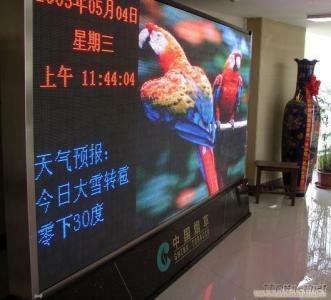 The indoor LED display models are specially designed for indoor use. They are extremely suitable for application fields of indoor advertising, banner, billboard or hoarding and information bulletin board, etc….